After leading Real Salt Lake Women to a second place finsh (4-2-2, 15 pts) in the inaugural United Women’s Soccer season, the club is proud to welcome head coach Mark Davis back for a second term in charge of the top women’s team in Utah. The West Jordan native returned to the continental U.S. after three years coaching the men’s soccer program at BYU-Hawaii, who won 61% of their matches with Davis at the helm. Following a very successful first season with RSLW, he also took over both the men’s and women’s teams at Salt Lake Community College, with both teams having great success in their first sanctioned seasons. The men’s team finished ranked number 18, and won the regular season championship before seeing defeat in the regional tournament in a shootout. The women’s team made it to the Region 18 final, losing in the overtime period. Preseason has been well underway for RSLW since January, and Coach Davis is building on last year by returning several players who have been with the team for many seasons, as well as adding new recruits from across the ranks of women’s soccer in Utah. The season gets underway on May 20th when RSLW hosts new UWS member Southern California Crush to start the 2017 season. Davis commented, "I am very excited to manage the RSL Women's team for the 2nd year We have very high goals this year and a great core group of players returning from last years team. The players are very professional and we are excited to the next step as a team in 2017. Photo courtesy of Bryan Byerly. Real Salt Lake Women make their final road trip of the season this coming Saturday, June 25th, with a visit to Santa Clarita for the return match against the Blue Heat. Only three games remain in the inaugural UWS season for RSL, and the team is in a great position with 10 points from a 3-1-1 record that has them in first place in the West Conference. They are closely followed in the standings by Houston Aces, whose 3-3-0 record has them at 9 points with only two matches remaining in their season. RSL has a few things in their favor to give them the chance to finish strong and claim a spot in the first ever UWS Championship match. Despite playing to a draw at home against Santa Clarita in their first meeting, thanks to late heroics from Bizzy Phillips’ converted penalty shot, RSL played a strong match and were close on several good chances that could have secured a victory. Their recent run of form should give them a lot of confidence in executing their style of play. RSL has been especially solid on the road, having wins in all three matches played away from Utah so far, and are facing a Santa Clarita team that lost their previous home match by a 4-3 score against Houston. They have a great opportunity to come out aggressive and finish with a perfect road record against the Blue Heat, who have just one win in 4 matches played, that being the unusual 10-1 season-opening victory in Houston. The team will still be missing co-captain Annie Hawkins, who still has not been cleared to play following the concussion she sustained against Santa Clarita on June 11. RSL has seen a lot of strong performances in her absence, especially the way that Kira Sharp has taken over Hawkins’ position in the midfield, with impressive play on both sides of the ball in Colorado last week. The team will continue to rely on the full 18 players in the matchday roster to use their speed and high energy to put pressure on the hosts and finish the season with a perfect road record. The players’ dedication and persistence has grown with each game. The team is getting important contributions from everyone in the lineup, and are being rewarded with positive results for their complete team efforts. Kickoff between RSL and Santa Clarita is scheduled for 9:00 EDT/6:00 PDT. Colorado Springs, CO - Real Salt Lake Women kicked off their two-game swing through Colorado in the best possible way, earning a hard-fought but well-deserved 3-2 victory over the Pride on a warm night in Colorado Springs. With injuries forcing some roster changes, coach Mark Davis still deployed a solid starting eleven. The defense in front of GK Rebecca Ritchie saw 15-year-old Brecken Mozingo stepping in at left back next to veteran CB and captain Natalie Norris. The young Alta High School sophomore played the full 90 minutes and showed a lot of maturity and skill in playing outside her usual attacking midfield role. Bizzy Phillips held down the defensive midfielder spot for the full match, and Kira Sharp took the place of co-captain Annie Hawkins in the creative role, playing the full 90 as well with a solid defensive presence, as well as being starting several of the attacking chances, including an assist on the game-winning goal. RSL had a great chance at an early lead as forward Madie Lyons found herself 1-v-1 with Pride GK Kalyn Smith, but the defense was able to close her down and prevent the visitors from scoring. The match settled down from there to see both teams trading runs of possession that led to scoring chances for either side. Both goalkeepers seemed to be on their game, but RSL’s Ritchie was especially impressive with several leaping saves to deny the Pride attack that had the crowd gasping at her individual skill. Combined with Mozingo, Norris, Ringwood, and Nielsen in the defense, they kept the match level until the Pride broke through just a minute before the half on a goal from a corner kick. RSL’s determination paid off in the first half stoppage time as Madie Lyons found Michele Murphy for the equalizer just before the halftime whistle. Coach Davis used both substitutions and tactical adjustments to make sure his team stayed focused, and his move to bring on Jess Vanderveur for Jeni Viernes at halftime would pay off in the 61st minute when Vanderveur took a pass from Murphy and hit a beautiful shot to give RSL the 2-1 lead. It was short-lived however, as the Pride had a 63rd minute equalizer on a curler from long range that just snuck past Ritchie’s fingers. 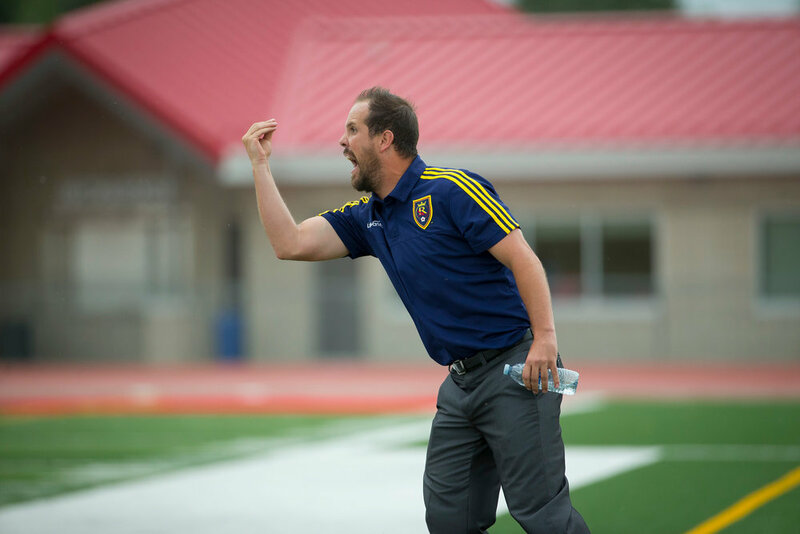 Despite the swings in momentum and lead changes, RSL kept their determination and pressed to get the win. It was a total team effort for the full match, and they were rewarded in the 81st minute when a string of passes got the ball in the box, and Kira Sharp was able to take advantage of the confusion in the defense to get the ball in front of Norris to poke home for what would stand as the winning goal. The team collectively held strong and fought off some late chances by Colorado through the final 9 minutes plus 3 of stoppage, and earned all three points and first place in UWS’ Western Conference. Though it was definitely a complete team effort to secure the win, a few individual performances stand out. Ritchie’s efforts in goal were outstanding, and without question saved the scoreline from favoring the home team. Natalie Norris showed why she deserves the captain’s armband with Hawkins and Colette Smith out, her work in the central defense and directing her colleagues on the back line being critical to containing the Pride attack. Michele Murphy continues to drive the RSL attack, especially away from home where her goal and assist from this match now give her three goals and two assists in leading the team to a perfect 2-0-0 road record. Parker, CO - The team had little time to recover, as their next match was scheduled to start just 39 hours after the previous one ended. Though the trip from Colorado Springs to Parker, Colorado is just under an hour drive, it’s a big challenge for the players to find some rest and recovery from a tough match on a warm evening while dealing with the travel. Regardless, after Houston’s win on Saturday, RSL found themselves two points out of first place and needing to dig deep to get another big road victory. Coach Mark Davis would call on most of the same players who started on Friday to get things rolling on Sunday afternoon, a day where the temperature was listed as 91° at kickoff, but measurements from the field were reading 111°. The match began with RSL controlling the early possession, and creating a few scoring chances leading up to the mandatory water break at the midpoint of the first half. After cooling off a bit, the teams got back to playing and the Storm made the first breakthrough scoring in the 33rd minute. The half finished with the hosts leading 1-0, and RSL once again needing to battle back to earn a result. With coach Davis making adjustments in personnel and tactics again at the half, RSL came out strong and controlled the possession to begin the second 45 minutes. Once again, super-sub Jess Vanderveur provided a much-needed goal with her tally in the 65th minute. Jess continues to be a huge spark off the bench for the team, and does a lot to pressure the opposing defenses and create opportunities for herself and her teammates. The second half water break came just five minutes later, and RSL continued to push for the winning goal with several quality shots, and pressure on the goal leading to corner kicks. Substitute forward Kim Gale made all the efforts pay off with her goal in the 74th minute giving the visitors the lead, which the team then summoned all their remaining energy to defend for the final 15 minutes plus stoppage. Though they walked off the pitch completely exhausted after two huge efforts in a 48-hour span, RSL also holds their heads high having taken all six points from the weekend, and remaining undefeated in three road matches so far this season, as well as holding onto first place in the conference. The team motto of “Dedication To Each Other” has been on full display lately, with the players leaving everything on the field to fight for one another and find a way to win. Coach Davis has expressed after both matches how proud he is of his players and the focus and determination they have to succeed. After returning victorious from Colorado, the team will get a few days at home before making the final road trip to Santa Clarita on 6/25, then finish the season with two home matches against the Storm (6/29) and Pride (7/7). Special mention goes out to defenders Stephanie Ringwood and Baylee Nielsen who played all 180 minutes and held the defense together through both matches. On the offensive side of the ball, Kira Sharp played both full matches as well, taking over the attacking midfield spot and contributing to the organization of the midfield in both offense and defense. Jess Vanderveur, as mentioned previously, subbed into both matches and had huge impacts in both, scoring important goals to keep RSL in a good position to win. Bizzy Phillips was solid in the holding midfield for the full 180’, and Michele Murphy continues to be an important part of the attack from the outside forward positions.